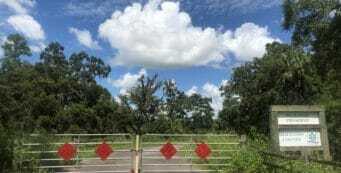 Hiking Sam's House | Pine Island Conservation Area | Florida Hikes! 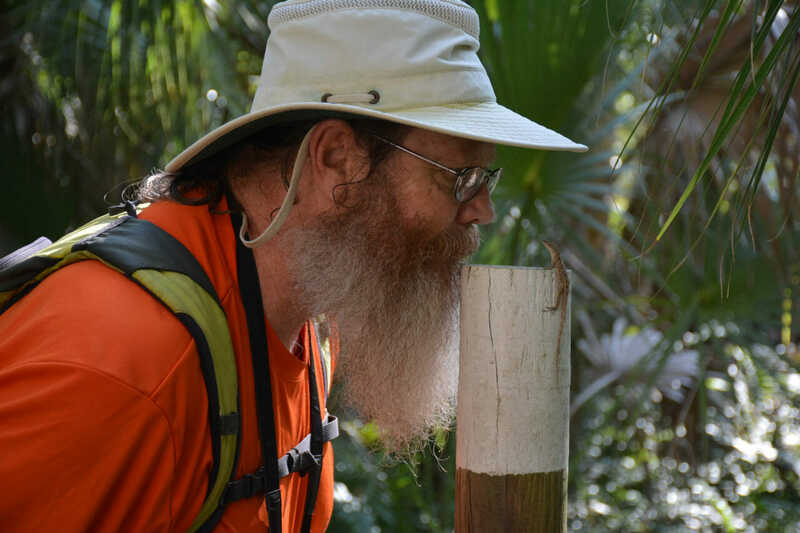 A delightful immersion into the natural side of Merritt Island, the trails at Sams House at Pine Island range from mild to wild as they draw you deeper into coastal habitats along the Indian River Lagoon from their start at this historic homestead off North Tropical Trail. 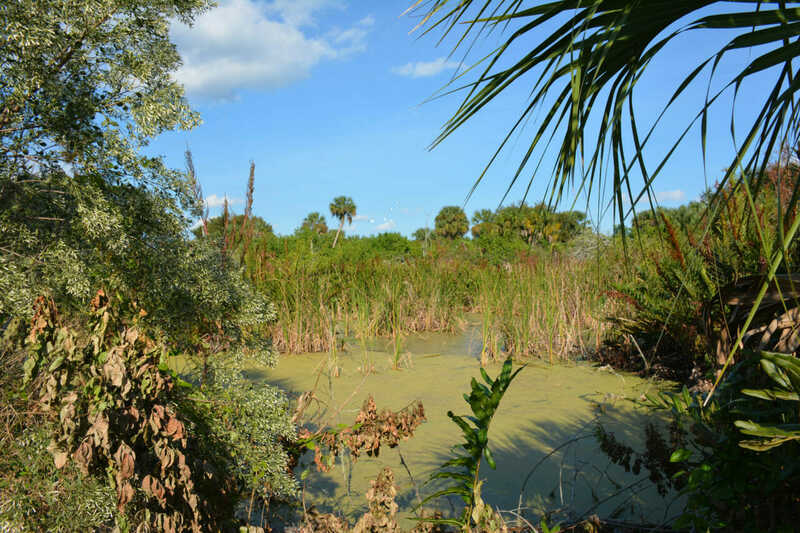 Managed as part of the Brevard County Environmentally Endangered Lands Program, this sanctuary showcases both history and nature. Pets and smoking are not permitted. The trails are open every day starting at 7 AM, closing around dusk (varies seasonally). Sams House is open Tue-Sun 9-5, closed on county holidays. 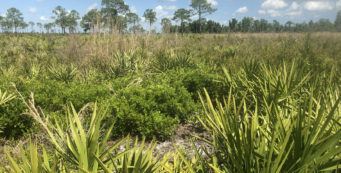 While managed by Brevard County, Sams House is on Pine Island Conservation Area, owned by the St. Johns Water Management District. 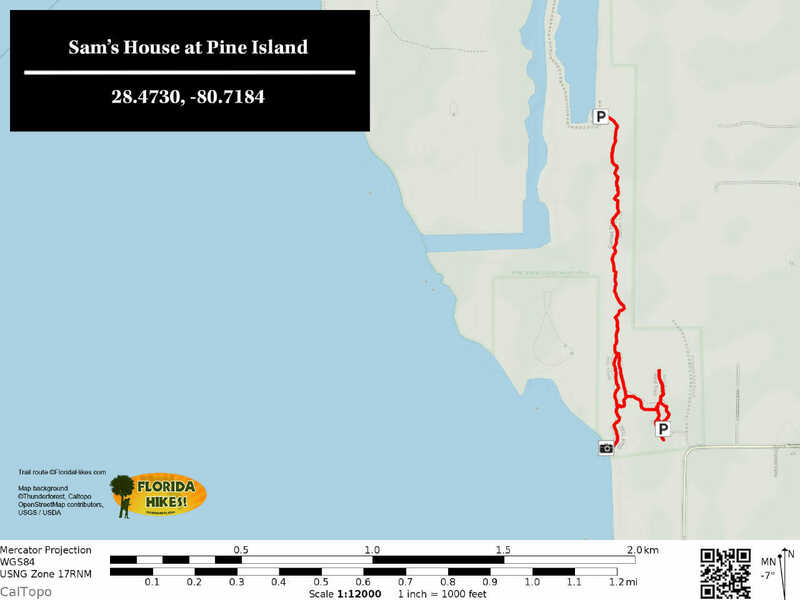 A separate entrance for Pine Island Conservation Area is at the end of Pine Island Road off N Courtenay Parkway (SR 3), where access to the Sam’s House trail system starts at 28.4837, -80.7209. From N Courtenay Parkway (SR 3) south of Kennedy Space Center, look for the turnoff to Tropical Trail to the west. Tropical Trail curves sharply left as you approach the entrance to Sams House on the right. Follow the entrance road to the parking area at the old homestead. The log cabin you enter when you arrive at Sams House is the oldest home standing in Brevard County. Built in 1875, it served the family well. They moved it to this location before building the adjoining larger home. 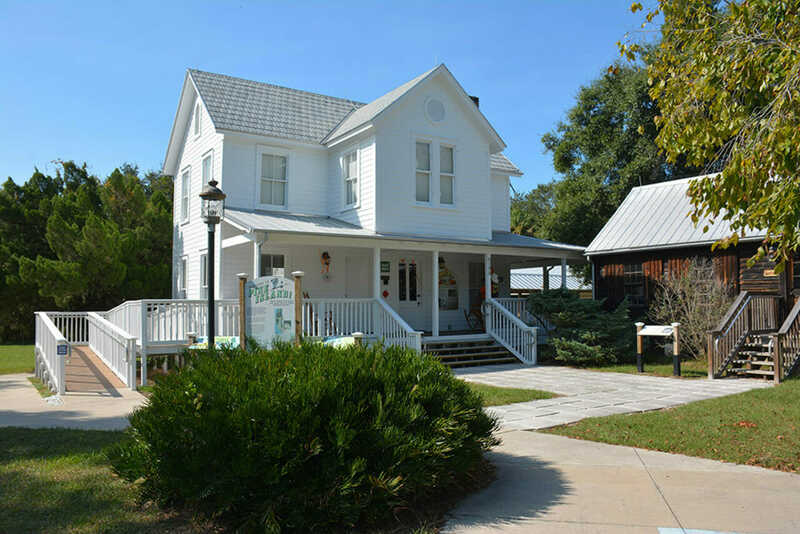 Now the cabin is an interpretive center and gift shop, a gateway for exploration of Merritt Island’s prehistory and its habitats. Sign in before you head out on a hike. Stepping out the back door, you can start down the accessible Discovery Loop. Go counterclockwise around this paved loop, which provides access to the rest of the hiking trail system. 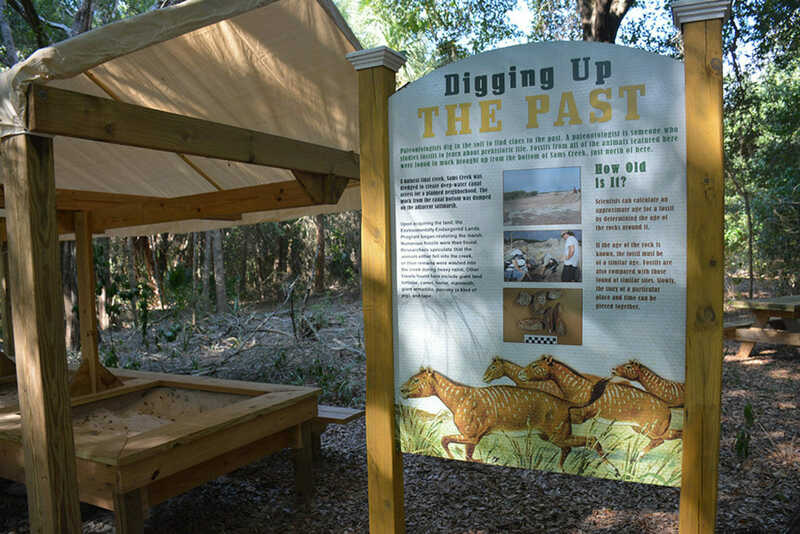 It has a variety of hands-on interpretive stations around it that kids will love. 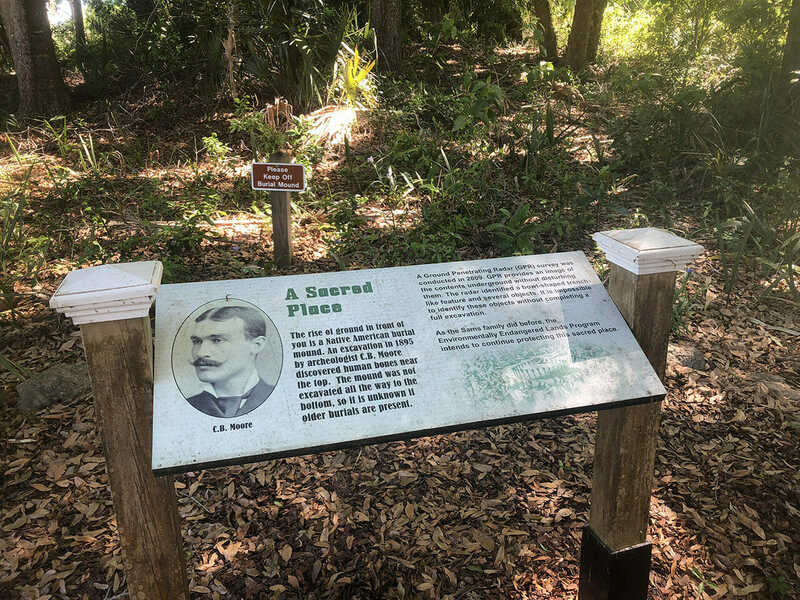 As you walk around it, it steps back in time from pioneer days on Merritt Island – the Sams family grove – all the way to when ancient creatures like giant sloths roamed the land. A 0.2-mile round-trip spur trail, the Conservation Trail, leads to an overlook on a marsh, where you are likely to see ospreys and perhaps even bald eagles. From the interpretive station next to the giant sloth, follow the white-blazed 0.5-mile Hammock Loop downhill towards Sams Creek. If you do only one hike in the preserve, make it this one. After the scenic crossing of the creek, turn left. 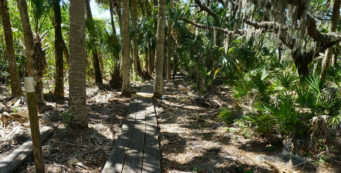 The trail makes a loop through a lush palm hammock where the breeze off the Indian River Lagoon keeps the fronds swaying. 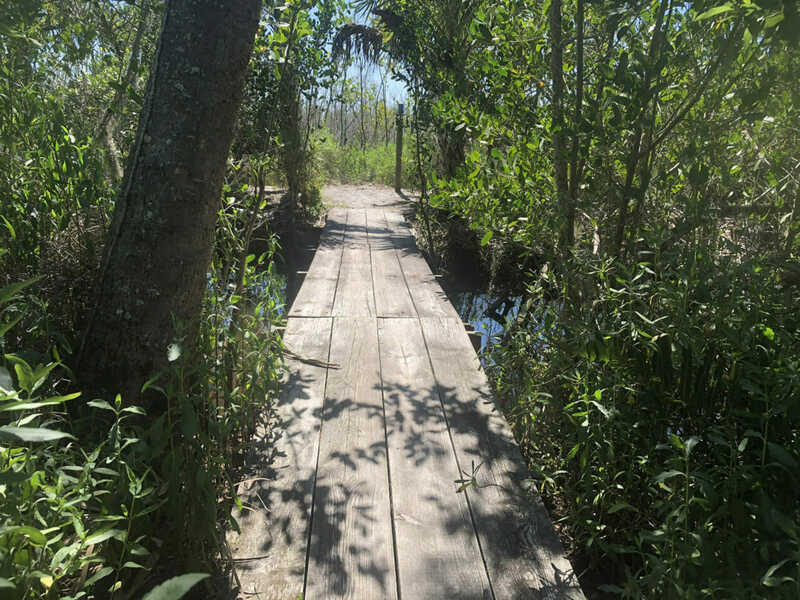 It starts out as a boardwalk, leading you to the blue-blazed Lagoon Trail. 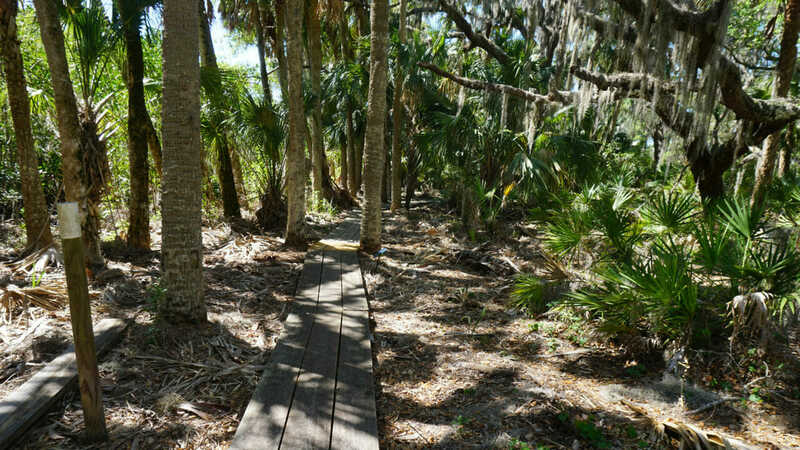 This side trail is also a must, with the boardwalk continuing through the palm hammock to another bridge. 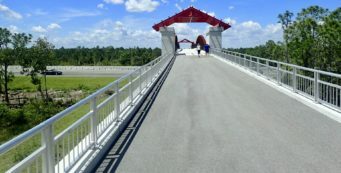 After the bridge, it follows levees from the mosquito control era on Merritt Island into a mangrove forest, emerging at an overlook on the Indian River Lagoon. 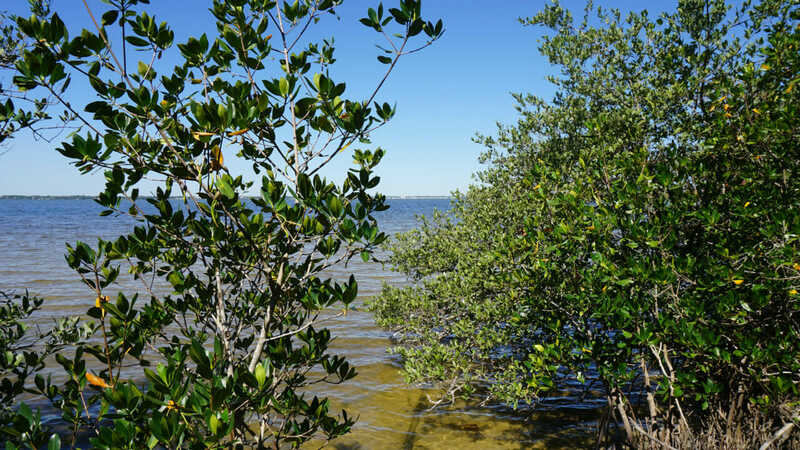 Between the mangroves, you can glimpse the far shore and make out landmarks in Port St. John. When you return to the Hammock Loop, this is your decision point. If the hammock is soggy you may wish to return the way you came, on the boardwalk. 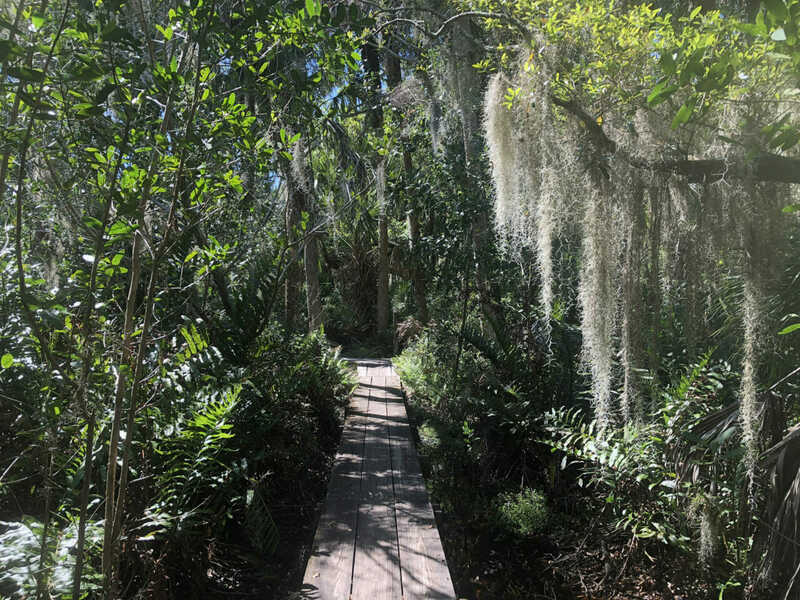 Otherwise, turn left and walk through the fern-dense understory under the palms to follow the Hammock Loop around the lagoon side of the loop. The Garnet Trail starts at the north end of the Hammock Loop. 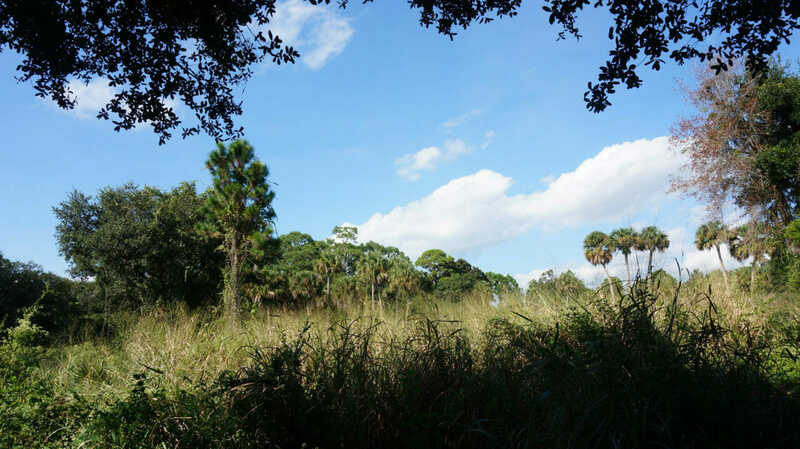 This is the wildest trail in the preserve, a linear trail that heads north to the access point of Pine Island Conservation Area. It tunnels through palm hammocks while providing views of marshes. It’s a scenic walk where you might get your feet wet where marshes creep into the trail, but you’ll also be rewarded with great birding. Keep alert for alligators along this narrow path between waterways. This round-trip adds 1.4 miles to your hike. Otherwise, the short trails at this end of the preserve add up to 1.4 miles of walking. Expect to see wildlife at Sams House! When you return to the parking area, take a very short ramble in the other direction to see the Burial Mound. Although it simply looks like a hill with a forest on top, it is not. Archaeologist Clarence Moore, the same fellow who excavated Mount Royal in Welaka, dug into this mound in 1895 and discovered ancient burials. This longer video includes a walk along the entire trail system. The one at the top of this page focuses on the don’t-miss Discovery Loop and the walk out to the lagoon, which can be done in a mile.